As with all children, there is a reasonable chance of growth between one year and the next. DD2 hasn’t much, so not much to do there. DD1 has a lot! Well, she is approaching her teenage years, and sprouting up is the order of the day. 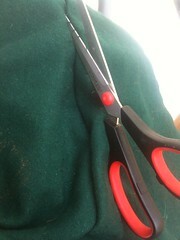 the kirtle length I had prepared for, but foolishly not the growth in arm – about 2 inches at least!! Luckilly Tudors were quite happy to add guards to things [mostly kirtle bottoms] and use a bit of contrasting wool as decoration. Sprouting up childer also known in the tudor times, and although there was lots of passing on of kirtles [both downwards in a family and in wills] there was also lots of making things last. 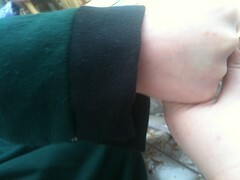 SO a decorative band at the end of the sleeve in contrasting wool – I have chosen black – is the order of the day. 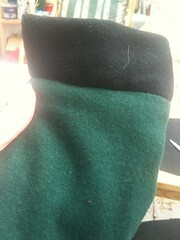 first I measured the end of the sleeve, cut out the wool in double the width I wanted with a seam allowance all around. I then added a strip of wool to the middle as this wool is lighter thant the kirtle linen combo, and I wanted them to have the same weight to them. 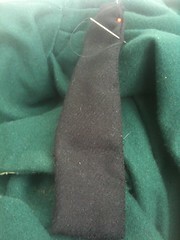 the seams were all turned in and pinned, and then checked against the sleeve edge and adjusted. 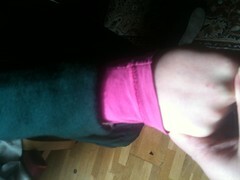 I whipstitched double thread all around my sleeve guard and then pinned it onto my sleeve. i initially pinned it on the inside planning to whipstitch one side and ladder the other, but due to the curve, the guard was too long. 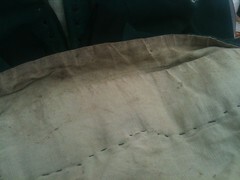 I therefore pinned to the outside – good side to good side – with my whipstitched close of the guard to be attatched to the sleeve. 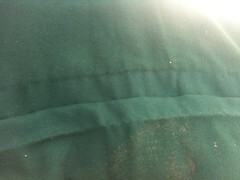 Finally I whipstitched them securely on with double thread, checking nice and firm and then opened out. It seems to sit nicely and looked good. 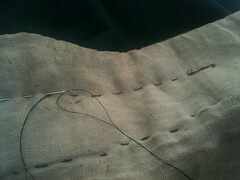 i will porb still ladder stitch on the other side to make nice and secure. 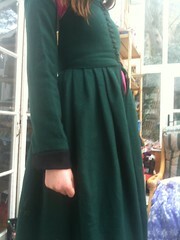 So here are the before and after shots [she is wearing a long sleeved t rather than a shift tho!] You can see just what arm length she has gained, as last year when i made this the sleeve went pretty much to thumb base. Going back to the original kirtle post, I added a growth tuck on the advice of one of the elves to account for growth in the future. 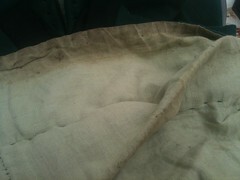 As I said, i did the tuck going in, when it was supposed to go out [like 20's pinafore tucks] , but was ok. So I tried the kirtles on both girls. 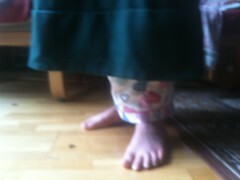 DD2 is fine, she hasn’t grown much and at that age the hem is anywhere ankle to midcalf and a bit more practical higher. DD1 has shot upwards – which I knew! perils of being a preteen. 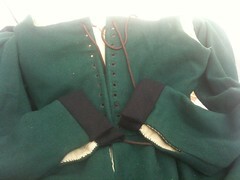 I am relieved that the bodice and waist are still good fits as some blossoming has been going on. I did notice at the v at the back there was some loose fibres of the linen lining – i think a lot of stress is put there when she puts the sleeves on and off. 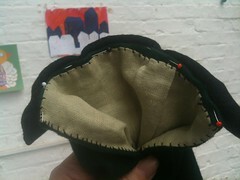 So i have stitched that a bit firmer. I will keep an eye on that bit as may need to patch it. 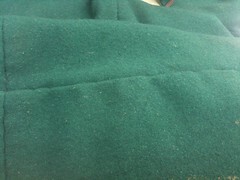 Here is the tuck seam on the inside. 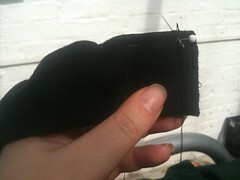 I was very lazy and just tacked with doubled thread! Well, it did hold. Look at all that grub! Will try and brush some out, but it will just get grubby again and can’t wash in washing machine as might shrink everything. 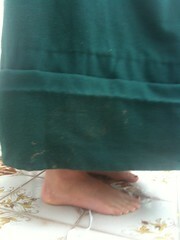 Another good reason to put a guard on, and also why the younger kids don’t have a linen lining!! 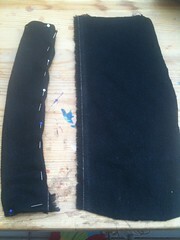 Due to this tuck the job was really simple I used the line of the tacking to tack approx half way between that and the tuck all the way round, with doubled thread. 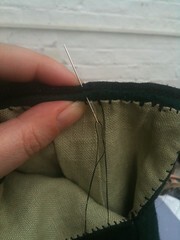 Then i cut open the original tacking and pulled out the thread. All I need to do is iron out the creases – leaving all ironing till the end btw so just can have an evening and get it done. So there it is. I am debating adding a black guard [tho a bit like bolting the stable...] as it will match nicely with sleeve, but will think about that and move on to other essential jobs first.